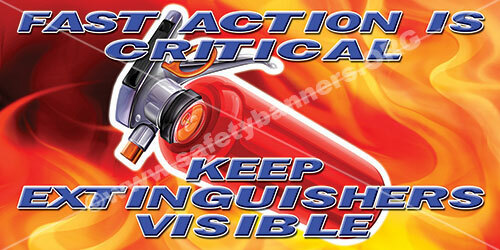 Safety Banners for Fire Safety and Fire Prevention. 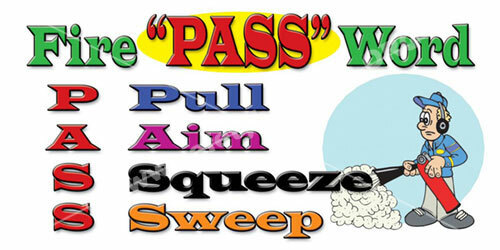 Including PASS Fire Extinguisher use banners. Safety Banners built in Memphis, Tennessee USA..
Our Safety Banners for fire prevention and PASS fire extinguisher use are used by most of the Fortune 500 companies! 80% of all manufacturing process material, powders and dusts are combustible! 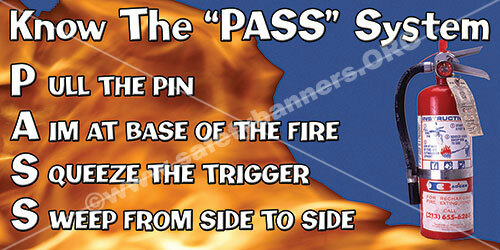 Safety Banners Can Help prevent fires. 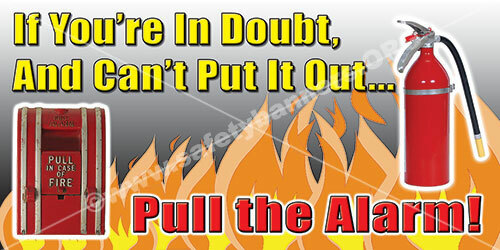 Fire Safety can save lives. Over 150 major fires occur in workplaces on an annual basis. 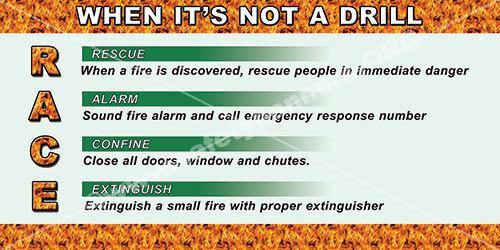 Fire is the third leading cause of accidental deaths in the United States. The Occupational Safety and Health Administration (OSHA) estimates that most of these accidents can be prevented if proper safety precautions at job sites are initiated. This poses a serious problem for exposed workers and their employer. The OSHA Fire Prevention Standards establish uniform requirements to ensure that fire hazards in U.S. workplaces are evaluated, safety procedures implemented, and that the proper fire prevention information is transmitted to all affected workers. 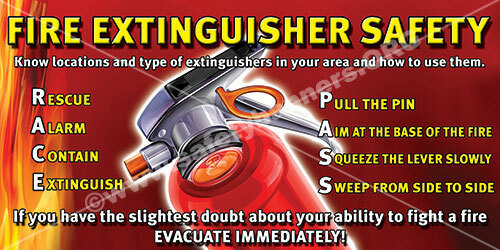 E - The person using the extinguisher must be trained to use it properly. 1. By cooling: Water is used to cool the burning material below the temperature at which it starts to burn. 2. By smothering: Carbon dioxide (CO2) or foaming agents are used to smother the burning material so that air is excluded. 3. By removing the fuel: This is usually very difficult to do. An example is turning off a fuel line.